For the first assignment, I have asked students to develop what I call "grid games" -- that is, games played on a board that has been divided into squares, following a grid pattern. The best known such games are probably chess or checkers, which are both played on an 8x8 grid. A similar grid board is used to play a game called Othello, though this is more a game of alignment than capture. Interestingly, the game we looked at last time -- Power Border -- combined both alignment and capture, with a chance element thrown in. But it too was a grid game played on an 8x8 board. The idea of a grid should help to keep us focused, while it is also more liberating than 8x8. After all, a grid can be quite big. Some of the games I played in my youth featured a grid, such as Dogfight and Gunsmoke. 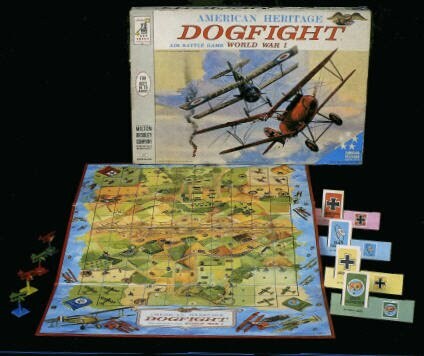 Dogfight puts you in the cockpitas a WWI fighter ace to battle for the control of territory while staying alive. 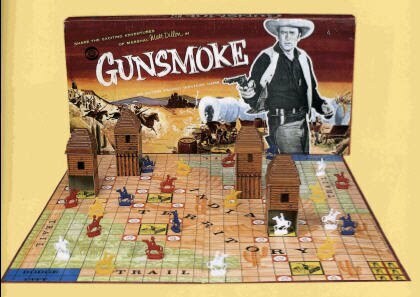 Gunsmoke was a classic western game of cowboys vs. Indians with similar territorial objectives. I want to emphasize that the grid does not have to be confining. It just helps to keep us on the same page so that we are dealing with some of the same problems and can get conversations going between groups. Ultimately, though, you will have to decide what elements you want in your game, using the four basic elements of games: strategy, chance, story (or mimicry), and physical skill. The grid board is just a place for that game to play out.